May is National Moving Month and the start of the busiest season for moving—which lasts until Labor Day weekend in September. It’s estimated that 70% of moves are made during this period, which means that it’s a particularly busy set of months for moving companies across the nation. Finding the right movers to help you relocate can be difficult when moving during the peak season when the most reputable moving companies are in high demand. If you’re thinking about moving soon, here are some useful tips on selecting the right Bay Area residential movers to ensure a successful relocation this summer. The first item on your to-do list should be to contact several moving companies in the area as early as possible and make an appointment with them for an in-home visit with a moving consultant. This moving expert will evaluate your project, budget, and moving goals, and propose a clear-cut, detailed planning strategy and a no-obligation pricing estimate. The value of this initial home meeting is priceless—allowing you to plan ahead and act accordingly while following clear, professionally prepared guidelines and your own personalized moving timeline. It helps to begin planning your move as far in advance as you can, and we suggest starting your search for a moving company a few months beforehand at a minimum. Keep in mind that the most reputable moving companies fill up with appointments early on in the year, so making the appointment as soon as you can is crucial. Damaged, lost, or stolen items. Additional costs and inflated final costs. Disappearing acts (resulting in the loss of a down payment, or belongings). Failure to meet important moving deadlines. Unprofessional behavior and poor customer service. Withholding of personal property for unagreed-upon payments. So, how exactly can you tell the good moving companies in San Francisco from the bad ones? Well, it’s pretty easy—as long as you do your research and know what to look for. The most qualified and professional moving providers will have plenty of experience in the moving industry, as well as a high number of prestigious industry certifications, recommendations, and awards to show for it. 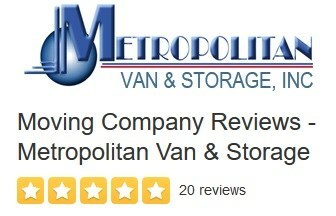 Metropolitan Van & Storage, for example, has been a well-known, highly rated Bay Area moving company since the 1940s, with five-star reviews and ratings from customers in San Francisco, the state of California, and across the nation. We’re Diamond-certified and BBB-accredited, with AMSA recognition and ProMover status. As an agent of world-renowned Atlas Van Lines, we are dedicated to providing high-quality moving services and world-class excellence in customer care, with a consistent 5.0 rating for over forty years. If you’re interested in making a seamless summer move this year, get ahead of the crowds and contact the professional Bay Area movers at Metropolitan Van & Storage right away! For more information on the services that we offer, give us a call now, or fill out our online form to request a free, in-home pricing estimate to get started.